Mount Marmolada. The Mountain is in northern Italy near the town of Cortina. This climb was a major landmark in alpine and women's climbing. At that time Beatrice lived at Burntwood Hall, Great Houghton, where she was governess to Catherine Dymond the daughter of Anne Dymond. Her Brother William H. Tomasson fought in the Zulu war and later became the Chief Constable of Nottinghamshire Following their family history gives an insight into Victorian society. It is noticeable how insecure life was at that time even for the wealthy. The Dymond family had lived in the Brierley area for many centuries, as can be seen from the Brierley Manor records and rental lists. Joseph Dymond was born in Brierley at the family home next to what is now Brielrey Hall on 5th December 1746. He was an astronomer and mathematician. In 1768 Joseph Dymond accompanied William Wales on an expedition to Fort Prince of Wales at the mouth of Churchill River, on Hudson Bay, Canada. Their task was to observe the Transit of Venus as part of a world wide survey instigated some time earlier by Edmund Halley the Astronomer Royal. The need to observe this astronomical event was vital to the future of navigation at that time. He died at Blyth Nottinghamshire on 10th December. 1796. Thomas Dymond was born in 1833 and lived to be sixty-seven years old. He was the manager of the Barnsley Main Colliery Company. He was married twice and his first wife Elizabeth, died in 1866, at the age of only twenty-eight. His second wife, named Anne, outlived him; dying in 1923. Thomas Dymond bought Burntwood Hall about 1868 and it then stayed with the Dymond family for almost a century. 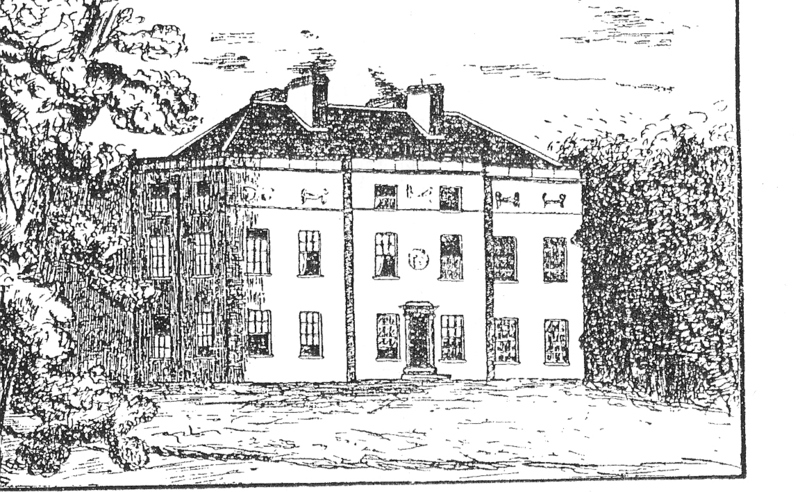 The hall at Burntwood started its life about 1775. At first there was a smaller building there, at a point called Burntwood Nook this was owned by a Mr. Marsden, a Barnsley solicitor. From him, it passed to John Marsden who was the vicar of Felkirk, and his son, William Henry Marsden, who died at Burntwood in 1815. Burntwood Nook was then bought by Mr. S. H. Taylor who built most of the present Burntwood Hall. The hall is a mixture of classical and Gothic revival architecture and on the south side there is a porch supported by Doric columns. It has the only 'secret' tunnel in the area that can be authenticated, running for thirty yards under the road to the kitchen gardens. West Haigh Wood and Howell Wood were landscaped as the grounds of the hall, as was the open space of the old Burntwood. Artificial lakes were set in Howell Wood and West Haigh Wood, the one in Howell Wood being the only one surviving today. The Hall had its own Gas works to provide heat and light, and an icehouse to keep food fresh in summer. Burntwood has always been part of Great Houghton but Thomas Dymond, being a Brierley man, had close connections with the village. He was churchwarden for Felkirk in 1876. Anne Dymond who was born at Penistone, was the aunt of Beatrice Tomasson. The 1881 census shows Thomas Dymond aged 48 Burntwood Hall with Anne Dymond aged 44 she shows her birthplace as Thurlstone, Catherine Dymond aged 5, and Frances Dymond aged 3. The Servants living there were: John Richards 20, Herbert Terry 14, Elizabeth Goodhind 26, Mary Cattes 36, Ann Cooper 16, Isobel Hope 32, and Amanda Rowbottom 17. Another member of the Tomasson family, who came to live at Burntwood Hall, was Hugh Skelton Tomasson. He was born 1874, his mother died ten days after his birth. He later married Jessie Mary Day, born in Brierley in 1866. Ben Day who was a railway pioneer, married Mary Dymond, born 1865, a child from the first marriage of Thomas Dymond with Elizabeth Johnson, who died with the birth of her third child in 1866. The Tomasson family came from Derwent village in Derbyshire. This village is now under the waters of Ladybower Reservoir. There is a baptism record dated July 18th. 1630, 'Dorothea filia Johannis Tomasson de Darwent'. The name Tomasson suggests that the family had originated in Denmark, but it could be a variation of the more English Thomasson. The upper Derwent valley was once a Grange or farm of Welbeck Abbey, which is near Mansfield, Nottinghamshire. 'Abbey Grange' is now under Derwent Reservoir. In 1538 Henry V111 confiscated the Abbey lands. This is when the farm would be available for resettlement. In the later 1500's a family called Eyre became known as 'Eyre's of Grainfoot', They had a 200 hundred acre farm at Derwent called Grainfoot, which was about one mile south of Derwent Reservoir Dam. There is a small valley on the eastern site of Ladybower Reservoir at a point called Grainfoot Clough. The possible origin of the farm was as a Grange at the foot of the Derwent Valley, 'Grangefoot'. Grainfoot Farm passed to the Tomassons by marriage. It is mentioned in the will of a William Tomasson dated 1745. It was about this time that the farm house was rebuilt. His great grandson, Thomas Tomasson also had a mill at Thurlstone near Penistone called Plumpton Mill. This was a woolen mill, making spat cloth and drab cloth, for coachmen and servants. It would start life as a water mill driven by the river Don. Many of the rivers running off the Pennine Hills were used to drive water mills. These were later converted to coal burning steam power. He had two sons, Hugh born in 1831, and William born in 1832. Hugh inherited the Mill, and William the farm at Grainfoot. William Tomasson did not keep to the terms of the will and the property at Grainfoot reverted to his mother, Katherine Tomasson, nee Eyre. She was the last Tomasson to reside at Grainfoot. On her death the property went to Hugh Tomasson of Plumpton. In 1861 Mr. Benjamin Oates occupied Grainfoot. There is another reference to Grainfoot dated 1881 when, John Harffoearth was living at the farm as farm bailiff or Manager, at that time the farm had 233 acres of land. The 1881 census records Hugh Tomasson aged 49 at Plumpton House; Thurlstone with Hugh Skelton Tomasson aged 7. Their Servants were Hannah Ogram 34, Ann Dixon 54, Julie North 20, and Jane Dickinson 19. Muriel Tomasson daughter of Hugh Skelton was born at Thurlstone in December 1897. She married in France in 1920, and lived in Paris reaching the old age of 102 years. William Tomasson the younger brother of Hugh, married Sarah Ann Hopkinson at Worksop, Nottinghamshire, February 23, 1857. Sarah was born at Oxton Southwell, Nottinghamshire in 1836. A John Hopkinson was listed as a farmer at Oxton in 1832, and on the 1881 census Elizabeth Hopkinson aged 73 who was born at Oxton, was listed as letting apartments at her home on Gravel Mount, Retford, Nottinghamshire. In 1822 there was an Ann Hopkinson living at St. James's Cottage, Doncaster. She was a Corn Merchant and had a Windmill on Balby Road and a Flour & Provisions shop in St. Sepulchre Gate, Doncaster. St. James's Cottage was a large house, near where the St. Francis Xavier Primary School now stands. In 1861 William and Sarah Tomasson had a 711 acres farm at Barnby Moor, Nottinghamshire, now called Grange Farm, this farm came into their possession via the Hopkinson family. William employed 16 men, 12 boys, 3 women, and 5 servants. William became known as the local Squire and called himself 'The Farmer of Barnby Moor'. William and Sarah's children were William Hugh, born 1858 at Grange Farm, and Beatrice born at Grange Farm April 25, 1859. Nelly born about 1863, and Thomas who emigrated to the USA. A fifth child named John was born at Barnby Moor; he died at birth or soon after in the spring of 1867. Grange farm buildings are at both sides of the Great North Road at the northern end of the village. Grange Farm House on the west side of the road and has been extensively renovated. The farm bailiff or foreman's home is unchanged except for some plaster rendering on the walls. It is of built with hand made red brick, and has red pantiles on the roof, and could be 200 years old. Barnby Moor in 1860 was a small place having some 240 residents. It had at one time two Inns the White Horse and The Old Bell but these closed with the coming of the Railway. Barnby Moor is a village on the road from London to the north of England. This road is known as the Great North Road. It was developed for horse drawn coach travel in 1741. The Inns would be busy serving travellers, and fresh teams of horses would be supplied to keep the Stage Coaches, as they were called moving at about 10 miles per hour. At its peak The Old Bell had stabling for 120 horses. The stages were set at about 2-hour intervals. At intervals a toll was payable at a Turnpike or Gate which gave these roads their name, of Turnpike Roads. Then in 1848 The North Railway was opened, and the stagecoaches were put out of business. On 26th. & 28th. September 1866 William Tomasson 'Farmer of Barnby Moor' sold some of his lands at Silkstone & Cumberworth, Yorkshire to a Mr. Dransfield. Henry Clark Farmer/Innkeeper of Tuxford witnessed the deeds. Tomasson's last entry in Nottinghamshire Trade Directory's was in 1864. In 1879 there were two new farmers at Barnby Moor, Charles and Joseph Bamford. The White Horse had reopened. John Bamforth was the Inn keeper aged 62. About the same time there was a famine in Ireland with a great loss of life. Following this many Irish people left the island to settle in The USA. This affected the native Celtic, Roman Catholic population more than Anglo-Saxon Protestants, and is a contributory factor in the North of Ireland problems. This made land in Ireland available for new settlement. William Tomasson and his family move to live there. The possible contact that led to this was Mr. Cooper Howard who lived at Brierley Manor House for a while in 1861. In St. Pauls Church Brierley there is a memorial to Louisa Blanche Howard who died in 1871, just after the birth of her second son. Her father, Frederick John Howard was private secretary to his uncle the 7th Earl of Carlisle when his uncle was Lord Lieutenant of Ireland (Queen Victoria's representative) in the years 1855 to 1864. They would have been close friends of the Dymond and Tomasson families. The diary of the High Sheriff of Kings County, now Co. Offaly Ireland in 1868 records of the arrival of the Tomasson family at Gortnamona House, Blue Ball, 5 miles south west of Tullamore. Gortnamona House is about 500 yards south of the lake at Blue Ball called Loch na Phailis. It was built by Moris O'Connor, son of John O'Connor, last Chief of the O'Connor's, and was leased to William Tomasson. EDWARD V1 had imprisoned an O'Connor Chief for insurrection about 1550 and his lands in Offaly became Kings County, the name Offaly was reinstated in 1920. William Tomasson knew the art of land reclamation and was successful in growing crops on what had been very boggy land. The Tomasson family had learned the art of reclaiming land from Peat Bogs on their lands at Grainfoot, where about sixty acres on the hillsides close to the farm had been enclosed. This has now reverted to rough woodland. Gortnamona means 'field of the Bog', not an unusual feature in Ireland. The house stands on low land 10 miles north of the Slieve Bloom Mountains. About 5 miles to the east there is the Moettia Peat Bog covering about 4 square miles, and to the west near Kilcormac there is an even larger peat bog. Both these bogs show signs of having been cut for peat to use as fuel. They are now being extensively worked for garden peat. In the same way that Thorne and Hatfield Moors in Yorkshire have been. The lands to the north of Gortnamona House, between it and the lake, show signs of man made drainage, as do the lands to the east and south, together making about two square miles of reclaimed land. To the east between the house and Moettia bog there are about another 5 square miles of reclaimed land. Gortnamona House was formerly Mount Pleasant House was built about 1790. The ruins of this house are still visible today. Percy French the Irish song writer who worked for a time as a drainage inspector, wrote these lines about the Woods of Gortnamona. Percy French also wrote the more famous song 'Phil the Fluter's Ball' . 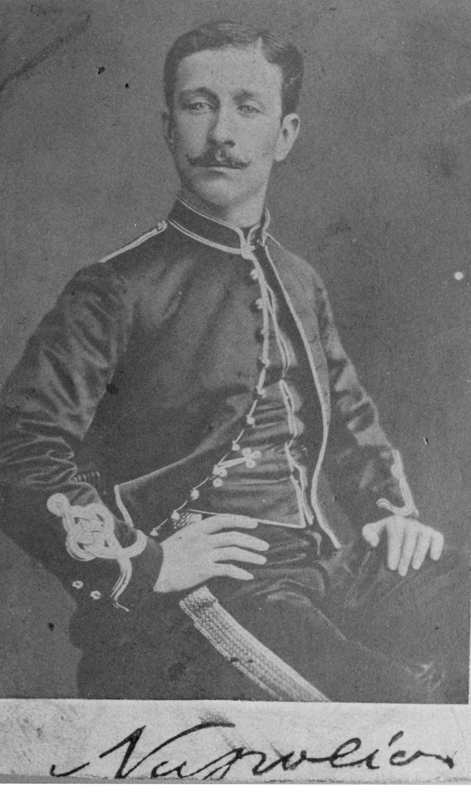 William Hugh Tomasson, Son of William and Sarah, left Gortnamona in August 1873. He was educated at Clifton College and joined a cavalry regiment. He traveled to South Africa and served as an officer in an Irregular unit, that is one raised by the British Crown, rather than by the Colonial authorities, intended to be disbanded at the end of hostilities. He wrote a book about his experiences, called 'With the Irregulars in Transvaal and Zululand'. In 1881. This is available in the British library. Serving with as a captain in 'Baker's Horse' a section of the Frontier Light Horse, he took part in the first aborted campaign against King Secocoeni of the BaPedi people of north-eastern Transvaal in 1878, and went on to take part in the Anglo-Zulu War of 1879. The FLH were heavily engaged in the northern sector of the war, and in particular at the battles of Hlobane, Khambula and the final battle at Ulundi. Prince Louis Napoleon, exiled heir to the Bonaparte throne in France, who had been attached to the British forces as an observer, was for a time in the same unit as William. The prince was killed in a skirmish while out on a reconnaissance patrol. a signed photo given by him to William Tomasson. William Returned to England. Then in 1881 aged 24, he was living in a town house at Mansfield, his occupation being Police Superintendent. Then in 1892 he was made Chief Constable of Nottingham and took up residence at Woodthorpe House, a country house about three miles north of Nottingham town centre. Later he became Her Majesties Inspector of Police for the North of England, He was awarded the M.V.O. 4th class in 1906, C.B.E. 1918, and the K.B.E. in 1920 He died in 1922. He was buried with full honors in Red Hill Cemetery north Nottingham, where his memorial stone can still be seen. The Municipal Corporations Act of 1835 had ordered boroughs to set up police forces, and in 1856 an Act of Parliament established police forces throughout the country. Sir Williams home at Woodthorpe House is a late Victorian Hall, similar to Burntwood but built with pale red bricks. It over looks about 50 acres of land, which were the hall gardens; these are now used as a public park. His daughter Kathrine who wrote several historical books, and died in 1966 was the last of the Tomasson's to reside there. Both the Tomasson sisters had been well educated on the insistence of their mother Sarah. At that time education for wealthy young women normally took place in the home with a private governess. Frances Mary Buss of London who was a pioneer of women's education had founded the 'North London Collegiate School for Ladies' near Marylebone, by 1871 it had become recognised as the first Public School for young ladies. Her associate Dorothea Beale another pioneer in women's education founded the 'Cheltenham Ladies College'. By 1881 Beatrice Tomasson was continuing her German studies at Potsdam near Berlin. Following the early death of his wife Sarah Ann, William Tomasson had moved to an apartment in a large house in Marylebone London, where he died in 1895. He never forgot his loss of the family farm at Derwent, in his later years he described himself as William Tomasson of Grainfoot. Beatrice Tomasson then became governess and private secretary to the Dymond family at Burntwood Hall. She accompanied Catherine Dymond on a Grand Tour to Europe. These tours by the wealthy usually included Paris, the French Rivera, and Rome. When Catherine married in October 1891, Beatrice became a governess at Innsbruck with the family of E.L. Strutt. This family introduced her to alpine climbing. Beatrice Tomasson's sister Nelly died in a swimming accident when she began work as a governess in Russia. Stanage Edge is the highest ridge of Millstone Grit in the east of the Dark Peak; it rises to 1502 feet, and overlooks Ladybower Reservoir. 'Stanage is famous amongst climbers for its diversity of routes, and the fact that it was on this four-mile rock wall that the sport of rock climbing was first practised'. At that time Stanage was a private grouse moor to which access was forbidden, so early pioneers of rock-climbing were forced to make secretive visits, or bribe the gamekeepers with barrels of beer. Despite this, climbs were made here as early as the 1890s by pioneers such as J.W. Puttrell. The Stanage escarpment starts just three miles south east of Grainfoot. It was probably on these practice climbs that Beatrice developed her skill as a mountaineer. Catherine Dymond married A.H Sharp in 1901. He died 1905, and she then married E. T. Murray who died 1914. Beatrice returned from Europe and was resident in London by 1910. The growing political ill feeling that led to the first world war probably made her an exile in her own country. She took many holidays in Ireland and was a spinster until age 62. In 1921 she married Patrick C. Mackenzie from Scotland. Their home was Little Benhams House, Friday Street, Rusper, Sussex. Friday Street took its name from a medieval Friday market that was possibly held in Dorking. Little Benhams House was an ancient brick building, part of which was renovated about 1920. It stood across the road from the Royal Oak Inn built in 1796. Beatrice died on 13th. February 1947. Hugh Skelton Tomasson J.P. the last member of the family in England, sold Plumpton Mill at Thurlstone to a company called James Durran who owned the nearby Phoenix Mill. He also had to sell the farm at Grainfoot to the 'Derwent Valley Water Board' for the development of Ladybower Reservoir. He died 20th. June 1938. Credits; Hermann Reisach, Alpine Guide, historian, and author. Ian Knight, Leading Zulu historian, and author.